← Who listens to Radio? Throwing a crazy party. I think that due to the fact I have always lived in a rather derelict style of accommodation and the guests I invite to any party I have ever thrown take advantage of this. I have awoken after house parties to scrub blood from the bathroom walls, pick cigarettes out of the carpet and vacuum glass off the bathroom floor. As my sister has recently got a new job back in New Zealand she has packed her life into a container and caught a flight back to the homeland. 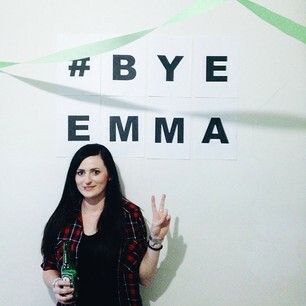 As she lived in a small apartment in Brunswick I offered her my place as a venue for her leaving party. My current house is the ideal location for a shindig on account of its huge size, outdoor area and long hallway which is a great location for those dirty smokers. As I have disappeared from the world of Facebook, I was unable to view the event my sister had created and had no idea of how many people she had actually invited. At 9pm there was just three of us, by 9:30 fifteen and by midnight the house was full. The people that filled every room were not just a little tipsy but out of their minds drunk. At one stage I walked into my bedroom to find at least five people in there doing something with a mirror on my bed. There was a stranger passed out on my bedroom floor and another couple getting hot and heavy in the corner. I went outside to find a girl eating a cake of butter which she had found in the fridge. There was someone standing on the kitchen counter using a frying pan to sing into due to the acoustics it created and my rubbish bin was taken in a taxi to catch someone’s vomit. The party eventually began to wind down at around 5:30 and the last person dancing in the lounge to Savage Garden was ushered out the front door just before 7am. I awoke the next afternoon to one big confusing mess. Why was there cutlery in the bathroom? Who had been watering the garden outside? What was that green stuff sprayed all over the tiles? And where on earth did the jam, beans and tomatoes go? 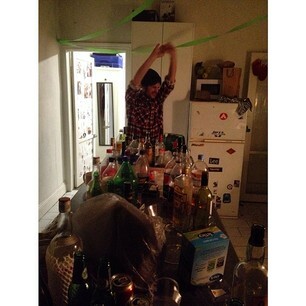 Sometimes, I really do enjoy throwing a party. I think I am blasé enough about the goings on to let everyone have a good time. I just wish others were around to help with the clean up the next day. This entry was posted in Life, melbourne and tagged 5am, celebration, drunk, house party, mess, party, savage garden, vomit. Bookmark the permalink. That sounds like a bloody good party. If I had been there I would have been the 7am Savage Garden dancer.